NEW InStyler MAX 2-Way Rotating Iron is the Ultimate Hair Tool! Have you always wanted to have celebrity level hair without hiring a personal hair stylist? 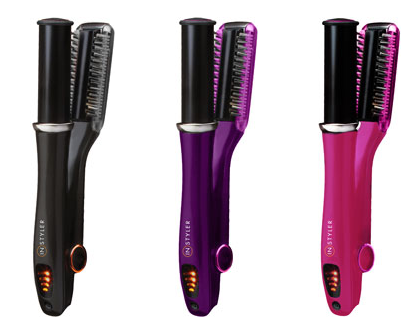 You should try the NEW InStyler MAX 2-Way Rotating Iron! Women dream of getting the same hair styling results at home as they do at the salon, and now InStyler makes that dream a reality! The InStyler is a rotating hot iron unlike any other styling tool. The patented design of the polishing rotating cylinder combined with bristles that separate your hair allow for lower heat and in turn won’t fry your hair like traditional tools. The InStyler brings your hair back to life with a shiny and polished look that’s easier than ever! Check out the website and watch the InStyler transformation videos available! The InStyler can straighten, curl, smooth, and shine your hair in minutes! This entry was posted in Hair on March 21, 2016 by Ashley.